Happy September everyone! Welcome to our no-spend month challenge! I was so happy to hear your enthusiasm when I announced that we’d be having a no-spend month in September. It’s fun to know that there are others out there challenging their spending as well. I’m planning on an encouraging month of sacrifice that accelerates financial progress. Going a whole month without spending might be hard. That’s why we call it a challenge! Just because it’s hard doesn’t mean you shouldn’t do it. Keep yourself motivated with a good goal. Having a solid goal will keep you in line and pull you through when it gets hard. When you’re tempted to cheat think of the reason why you took on this challenge. It probably wasn’t just for fun. 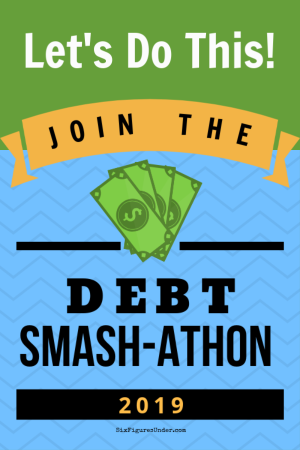 We want to really maximize our September debt payoff. Since our August income was as high as it has ever been during our debt payoff years, we want to use as much of it as possible to put toward our debt. At the same time, having a no-spend month right after a high income month will keep us in check and we won’t be tempted to use our extra income frivolously. The beauty of a no-spend challenge is that you can adapt it to your own situation. To get the most out of this challenge, you need to set specific rules. “I’m just not going to spend as much” is not a rule any more than “I’m going to eat better” is a diet plan. You can’t keep yourself in check without specific rules. I suggest writing down the rules and telling someone that will hold you accountable. Lots of you shared your plans in comments to the original post. If you need ideas for possible rules, check out the comments. I’m really behind on responding to comments, but I have read them all and I’m excited for the great things you’re going to do!! We won’t spend money on food (groceries or eating out), clothes, entertainment, gifts, or household needs (toiletries, baby stuff, home office stuff, etc). I do have one exception and that is to get new running shoes for my daughter who runs cross country. I thought her old shoes would last through the season, but they are literally falling apart. I had planned to get some in the last couple of weeks, but that didn’t happen. We will continue to pay for all of our normal insurances, utilities (we pay for internet), gas (and other car related expenses that come up), and tithing. SixFiguresUnder will have its normal varied blog content on Monday, Wednesday, and Friday. On Tuesday and Thursday I’ll be writing content especially geared toward the no-spend month challenge. Check in here every Tuesday to discuss how we’re doing. I will add a link-up (something I’ve never done before) so those of you who are blogging about your progress can share your posts. If anyone has a post to share today about getting started with your no-spend month, feel free to leave a link to your post in the comments. Our closed (private) Facebook Group Making Frugality and Finance Fun is a great place to interact with others who are taking the no-spend challenge and who are generally frugal folks. Feel free to follow the link and request an invitation to join. It’s an encouraging group! I’d love for you to share the rules that you set for yourself. Are you in this alone or is your spouse or family in it with you? What is your “why”? What are you going to do with the money that you will save by not spending in September? My husband and I are going to join in on the no spend month. Our only rule is no eating out. We live in a city where most people go out to eat on the weekend because the food is so diverse, but this month we are going to pass. The hard part will be; eating out is what our friends do, so if we don’t go out to eat we may not see them. We will be inviting everyone over this month for bon fires, billiards, lawn games etc. I know we can do it, I am just worried about our friends not wanting to join the games instead of eating out all month. I am excited to do the no-spend challenge this month. My “why” is because I also want to make a big payment towards debt – my husband’s debt. I have a reverse situation in that I am the breadwinner of the family and have no debt. My husband has an enormous amount of debt and I am finally to the place I can help pay it off. I want to start with a bang and make a large payment to this. My goals this month are groceries will be $20 per week (milk and fruit and veggies only). I will be eating out of the pantry especially older food that I have canned. I also have a friend visiting for a week so while we will eat out that week we won’t eat out the rest of the time. I really looking forward to this challenge and how everyone does. Good luck everyone. I am using the No Spend Month to actually follow the budget and not give in to the extras that are not real emergency . We have several events this month that have gone into the budget all ready and we are not spending past the budgeted amount. My only rule will be no eating out. September isn’t a good month for me. I’ve got a lot of things that need to get done (like an oil change) and I’m going on vacation the end of the month. When I started my debt repayment in January, I planned on not making a debt payment this month and using that money towards my vacation. Since I’ve been doing amazing with my spending, I will still be able to make a debt payment this month! (Like you, my minimum payment is zero). I’m also going to keep my grocery budget to $100. Already spend $78 on it but I’m challenging myself to make it work, and it should! We aren’t doing a “no spend” month on purpose. Instead, we’ve had a lot of major expenses the past week or so and are going to try to cash flow them without having to dip into savings. So we are living very minimally for two weeks and then hopefully with some overtime, we will be able to make an extra payment the second half of the month. Thanks for the encouragement and motivation. I have been following this website for a while and my hubby and I have finally gotten things together enough, or fed up enough, to come to same the same mentality. I have just set up a budget for us so we can start making a dent with our debts. It’s not going to be easy since I am on disability and only get a small stipend coming in each month, but we are going to try! And this No Spent Month sounds like a perfect way to start! Usually, I follow a couple of Big Discount Deal sites that email me information daily on things I can get at a huge savings and I buy our gifts on these when something I see comes up that I know would make good presents for our family. But this month, I’m making it a rule that I will just delete all emails for these sites without even looking at them, so I won’t be tempted to buy anything! And another Rule, I will grocery shop online, before I go to the store, so I will have a list with all the prices and have cash in hand, so I won’t do extra shopping. We will be eating a lot of our frozen meals I have made and stored in our big freezer, so I can keep the food budget down. And the last Rule, I will be thinking of ways to help market my hubby’s Etsy Shop, BestFriendsNibbles, a Spent Grain Dog Biscuit Store, so it will start to bring in some income. Every little bit helps, right?